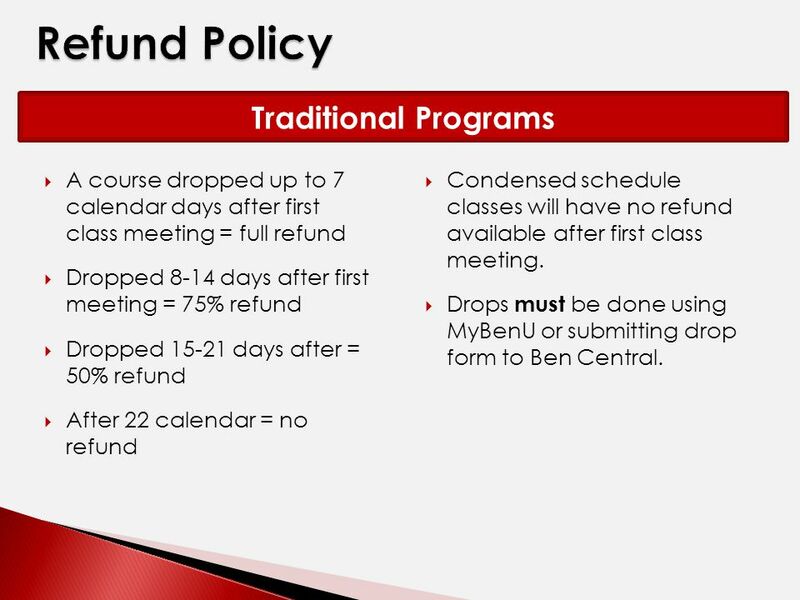 2  Tuition, fees, and housing charges are due 7 calendar days after the first day of class.  Acceptable forms of payment include: cash, personal checks, cashier’s checks, money orders, Visa, MasterCard, and Discover. 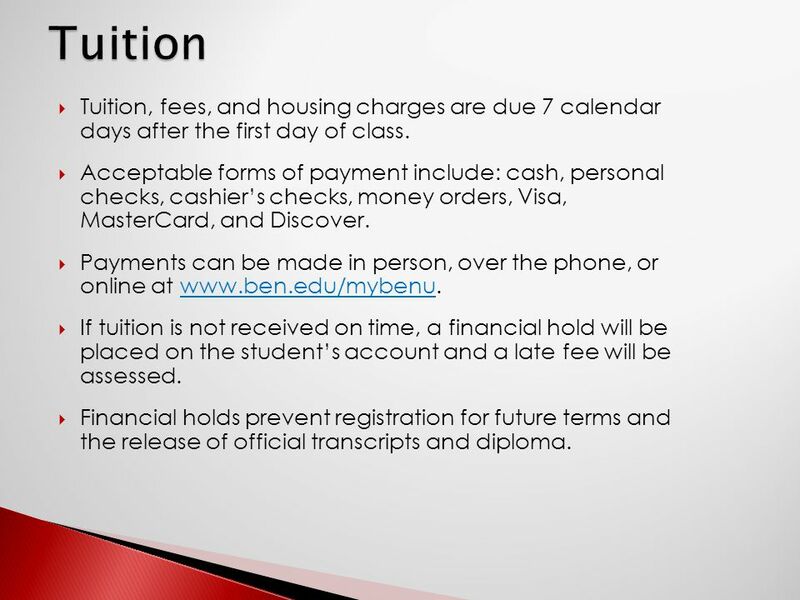  Payments can be made in person, over the phone, or online at www.ben.edu/mybenu.www.ben.edu/mybenu  If tuition is not received on time, a financial hold will be placed on the student’s account and a late fee will be assessed. 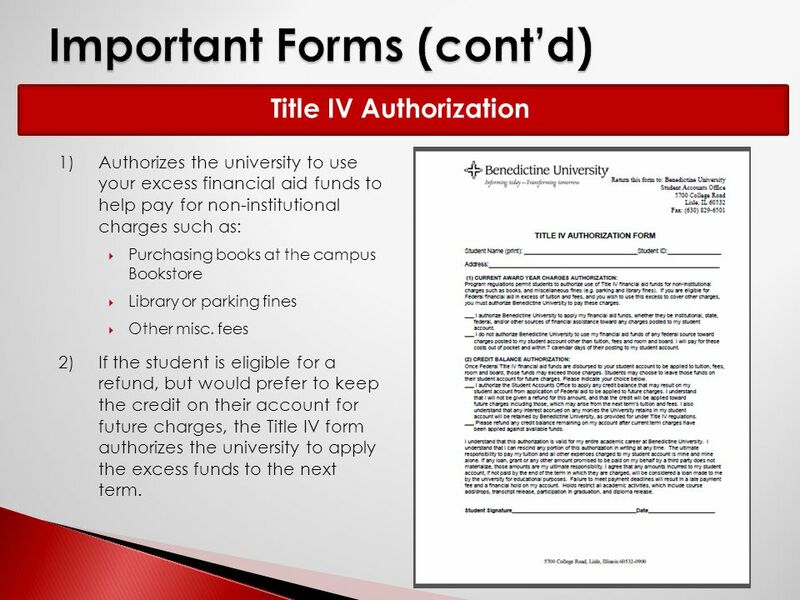  Financial holds prevent registration for future terms and the release of official transcripts and diploma. 4  Administered through HigherOne.  Interest-free monthly payment plans.  Annual budgets and single term budgets available. 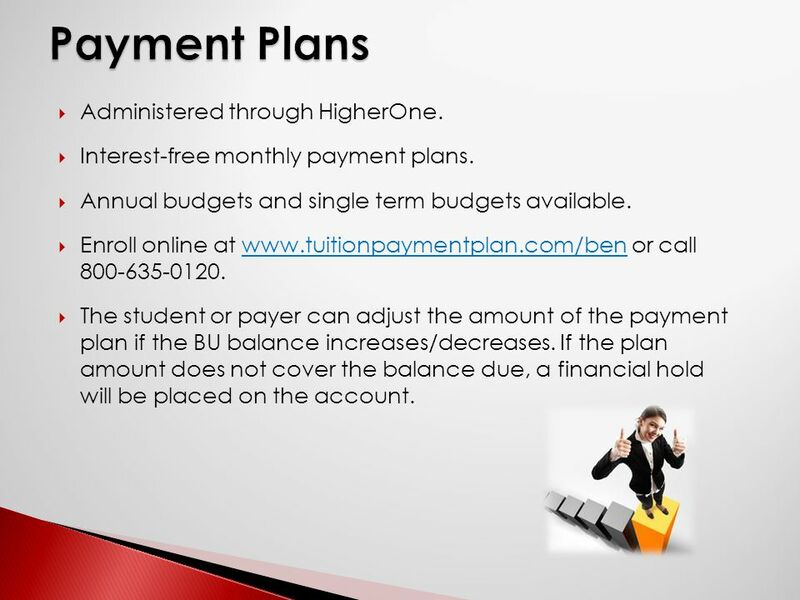  Enroll online at www.tuitionpaymentplan.com/ben or call 800-635-0120.www.tuitionpaymentplan.com/ben  The student or payer can adjust the amount of the payment plan if the BU balance increases/decreases. If the plan amount does not cover the balance due, a financial hold will be placed on the account. 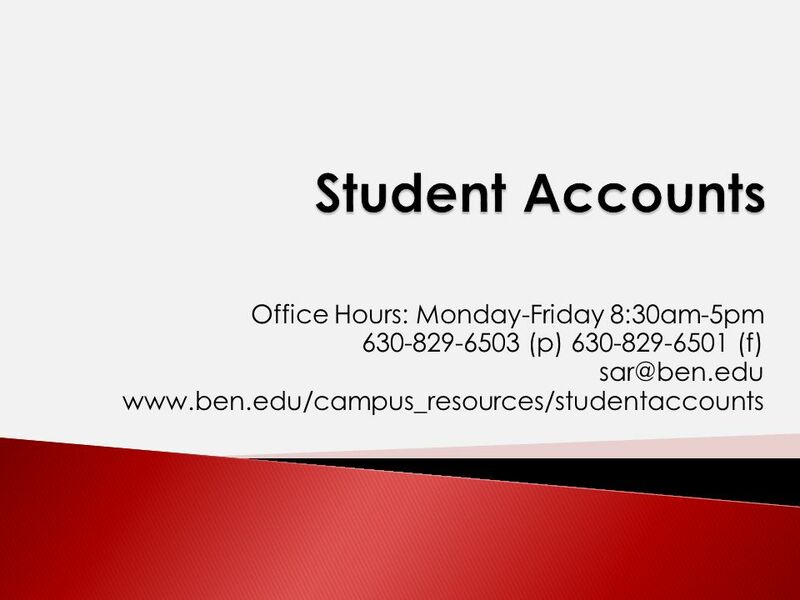 Download ppt "Office Hours: Monday-Friday 8:30am-5pm 630-829-6503 (p) 630-829-6501 (f)"
Presented by The Office of Student Accounts. Topics of Discussion Cost of Attendance Billing Payments Attendance Confirmation Parking Other Goodies. Student Payment Options & Student Insurance. Emergency Loans The Emergency Tuition and Fees Loan Program is a short-term loan in which students are attesting. 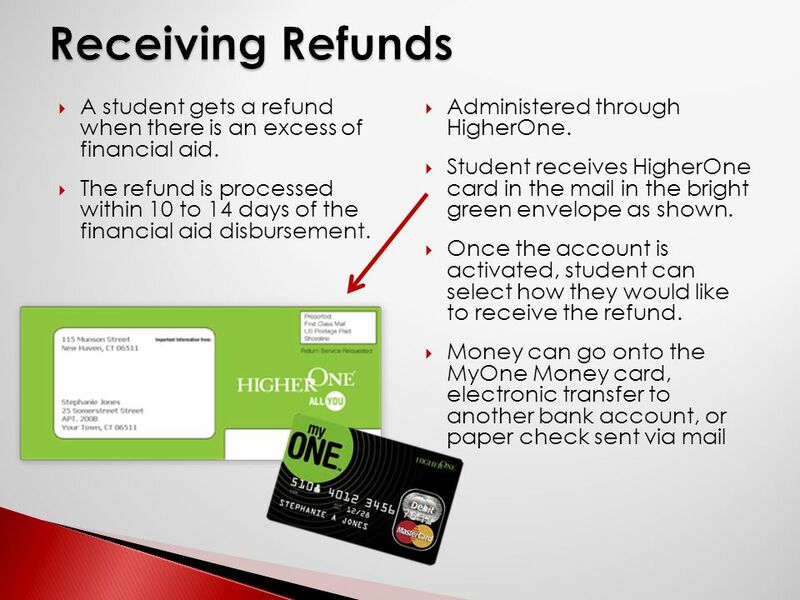 Paying for Registration Fees A Student Orientation Presentation By Student Financial Services. Your Student Bill online.  Tuition Fees  Board of Regents Approve Fees (usually in July)  Vary according to your status  Segregated Fees-Mandatory. Paying the Bill Student Business Services 2. Student Accounts Orientation. Contact Information Website: Address: or Location: 424 E. Broad. 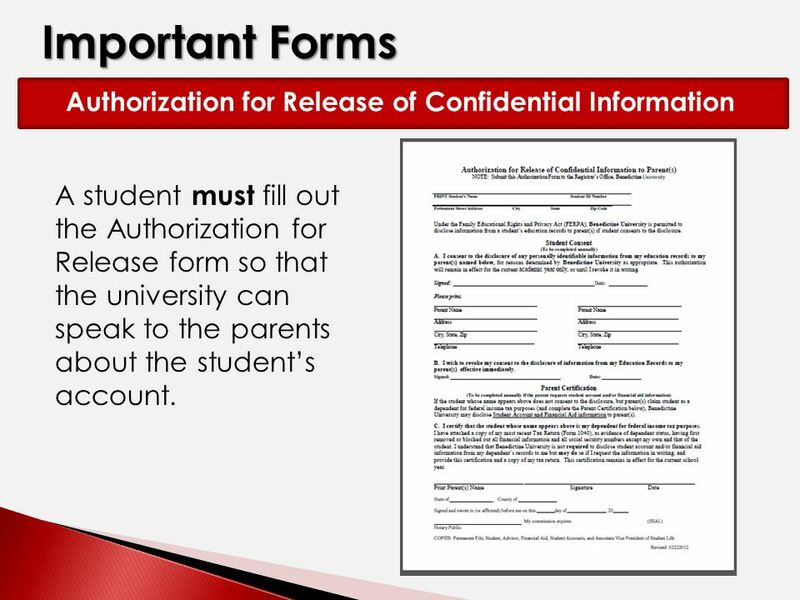  Before registering or looking up classes for the first time each semester, students must accept the Financial. S tudent B usiness O ffice Presented by Bob Putich Lynn Plancich. Welcome to Texas Tech University File Early. Student Business Services Information Student Business Services is a student service oriented office that. Welcome to the Bursar’s Office A copy of this presentation can be found on the Bursar’s Office Homepage at Bursar’s Office 131 Schwartz. 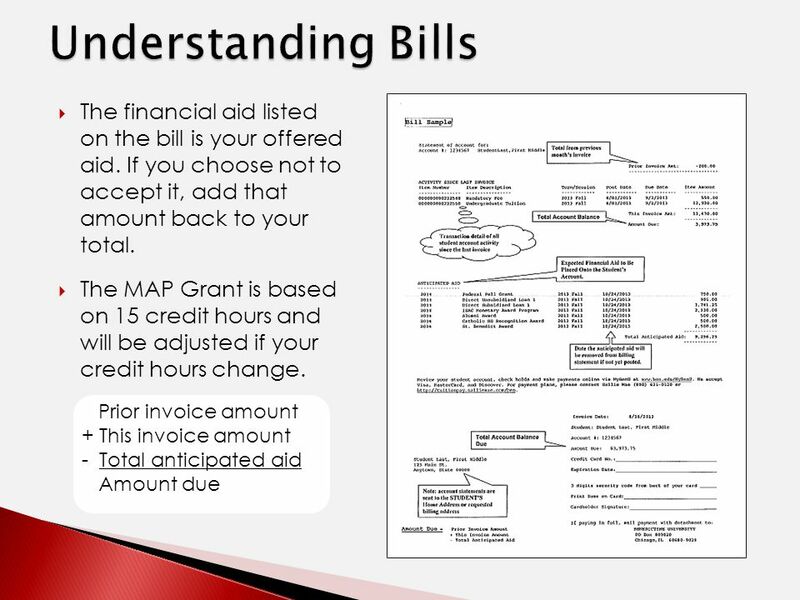 1 Finding Out What The Student Owes Paying Tuition & Fees Financial Aid Disbursement Managing Finances Information Resources Questions.